One in 10 American children today lives with a grandparent. Of those approximately 7.7 million children, census figures show that grandparents are the primary caregivers for 3 million, including more than a quarter of a million children in Texas. Many grandparetns don’t think twice about assuming the custody of grandchildren when the need arises, because family ties and familial love initially overcome practical considerations. However, forming a"grand-family" a household in which a grandparent, in the absence of parents raises grandchildren — has far-reaching effects on lifestyle, grandparent visitation rights, economic status, and often quality of life. Unless the child's parent(s) sign a power of attorney giving you the power to say where the child lives and to make decisions for the child, you must go to court to get custody over a grandchild. This means you have to file a lawsuit in a court asking the court to give you custody of the child. Both of the child's parents, a surviving parent, the child's court appointed managing conservator, or the child's custodian have to agree that the child should live with you. Be able to prove that the child is being hurt because of the child's living conditions or by the people caring for the child. If You Are Raising a Grandchild - The National Family Caregiver Support Program provides support for the growing number of older people who care for children. This program can help grandparents or other relatives (55 and older) who are caring for a child 18 or younger. Call 1-800-252-9240 to learn more. Texas Health and Human Services Commission provides assistance for Texas grandparents caring for grandchildren living in their home. (PDF file) En Español version too. 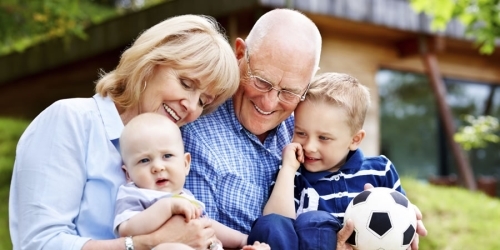 In Texas, a court can authorize grandparent visitation of a grandchild if visitation is in the child's best interest. Learn about access, custody and visitation referrals. AARP, The Brookdale Foundation Group, Casey Family Programs, Child Welfare League of America, Children's Defense Fund and Generations United have partnered to produce state and national GrandFacts fact sheets for grandparents and other relatives raising children. Grandparents Raising Grandchildren State Resources...realizing you're not alone...More than six million children - approximately 1 in 12 - are living in households headed by grandparents (4.5 million children) or other relatives (1.5 million children). Learn about public benefits available to grandparents and other relatives and the children they raise vary from state to state. Anyone with children can tell you that raising them is a challenge. Grandparents have already met that challenge once with their own children. But now many grandparents are called upon to meet it again with the next generation.